The Haines Highway passes between the Chilkat River and the Takshanuk Mountains. Roadside pullouts, with views of the river and mountains, are good places to stop and scan for wildlife. Species found along, or sometimes on, the highway include moose, coyotes, wolves, porcupines, and brown and black bears. A pair of trumpeter swans is often seen in the ponds near mile 5 in the spring. Pink salmon spawn in 10 Mile Creek in late July and August. 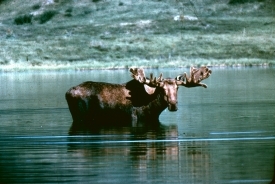 Moose dip their heads to munch on underwater plants at roadside marshes, like the ones at mile 12 and 14. The slide area at mile 19 is a good place to look for mountain goats. Bald eagles circle in the sky or perch in trees, especially where the highway paralells the Bald Eagle Preserve between miles 9 and 30. The Haines Highway extends 42 miles to the U.S. - Canada border, making day trips into the Canadian alpine possible. The Haines highway passes along river, marsh, forest and alpine habitat. This diversity of habitat makes it possible to spot a wide variety of bird and mammal species from the road. The best time to see moose along the highway is in the early morning hours. If you see wildlife while driving the highway, don't stop suddenly in the middle of the road. Instead, find a safe place to pull over and enjoy the experience without endangering yourself or others. The Haines Highway heads northwest away from downtown. Follow Main Street away from the water to reach the highway.